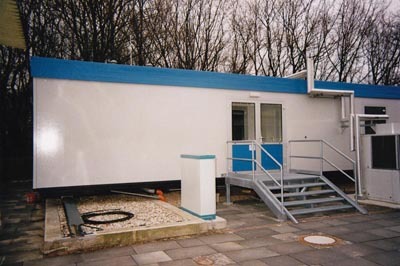 According to the customers wishes we can be provide the UNO Mobile Unit with a laboratory testing area, toilet, shower/changing room, corridor with sluice, storage room and a room for boiler, uv-filter installation and workbench. 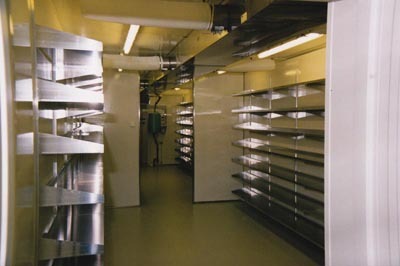 The layout of the units can be adjusted to keep space for building-in an autoclave. (An UV-Filterinstallation for drinkingwater is optional). The modules are fabricated of plywood, polyester, triplex and styrofoam plus a steel construction on the flooring. Rubber ceiling sections garantee an airtight sealing (dirt- and dampproof). The floor in the entire cabine is finished with seamless polyester, strengthened with glass fibre. The ceiling is also be finished with seamless polyester, therefore you will have a complete seamless laboratory testing area. The side walls are fabricated seamless, out of one piece (vacuum press). The walls are strengthened with wooden beams 30x30 between the styrofoam so that you have a solid construction. The front and back wall is constructed exactly the same way. The door opening in the front and back wall are also be cut out later in the production process. The outer doors are made fitting the same way as the inner doors. A window, put up in an aluminum frame, will be placed in the front door. Water service-pipes and electricity will be completely integrated in the walls and ceiling. Power-points and other electrical switch material are splashproof. The electrical lighting in the testing areas are splashproof fluorescent armatures. This product is designed in close cooperation with you, therefore please contact us if you want more information.